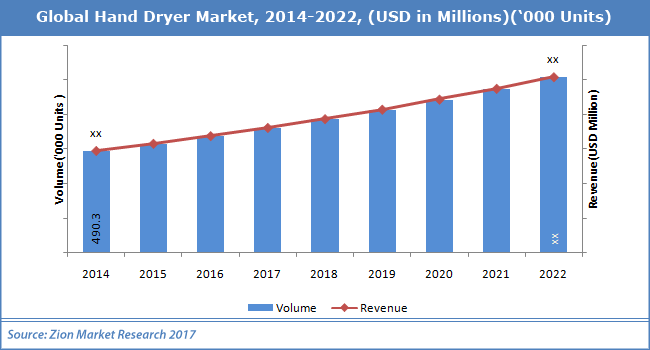 Some of the major companies comprised in hand dryer market is Bradley Corporation, American Dryer, Inc., Electrostar GmbH, Dyson Ltd., Mitsubishi Electric Corporation, Excel Dryer, Inc., and World Dryer Corporation. These players are set to bolster global hand dryer market in the years to come. According to analysts at Zion Market Research, global hand dryer market added up for USD 490.3 Million in 2014 and is estimated to cross USD 1.2 Billion by 2022, developing at a CAGR of 12% from 2017 to 2022. Increasing awareness about operational price is powering the growth for hand dryer market, as per analysts at Zion Market Research. Swiftly growing hospitality sector with an elevation in the number of pubs and restaurants & hotels indirectly is powering the development for hand dryer market. The increasing adoption of hand dryers is likely to foster the development of the global market. The need to meet cleanliness standards for hospitality industry and food service sector is also one of the reasons that bolstering the development of hand dryer market. In addition to this, rising investment and R&D performed by market players is also set to thrive the global market. For example, in July 2018, Dryflow Vapordri, one of the quickest developing hand dryers in the world patented water evaporation system thereby, powering the development of hand dryer market. Global hand dryer market is divided into the 2 basic kinds of product such as jet hand dryers and hot hand dryers segments. Hot hand dryer market is ruling in terms of volume with over 65% share of the global market owing to its Hygienic nature and low-price benefits. Increasing number of restaurants, food outlets, and food park in food processing industry are powering the development of hand dryer market. The food processing sector is likely to develop considerably in the global market during the forecast period. Clinics & hospitals sector is one of the quickest growing segments in the hand dryer market, developing at 14.1% CAGR in the years to come. Based on region, Europe stood as biggest area for the hand dryer market and is likely to develop considerably owing to prominent requirement from France, the U.K., Italy, and Germany among others. North America is a second biggest area in terms of volume for hand dryer market. Asia Pacific is likely to show healthy development owing to health awareness and developing infrastructure development in nations such China and India.